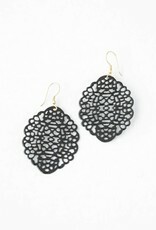 Intricate and pretty, these earrings are just what you need to spice up your style! They are light enough to wear daily and beautiful for a night out. Earrings measure 3". Made from recycled materials and covered with resin. Nickel-free. Made fair trade by women in India.